I write this after a rather long day. A day though that brought to mind just exactly who we are and what we do. Given I have a tendency to become rather absorbed in subject matter and spend many hours contemplating an issue - often through the written word, I will attempt to keep this to the point and coherently address each point. Today was a full Council meeting, which started early for us, as a group, at 9am with a pre-Council brief on matters of the day. Whilst a number of motions and amendments had been tabled I had stuck with two questions to ask of Council, two questions that are particularly topical in Fife and Fife schools. I was keen to see how they would be responded to and what returns I would get on both supplementary questions. Today's business was dominated by discussion, debate (at times, heated and almost visceral) on current Welfare reforms. Whilst it was not a debate I spoke during as others within my group are far more qualified and versed speak on, I was struck by something as I listened and looked around the Council Chamber. This is what I have been fascinated by for well over 20 years. The lively interaction, sparring and heated exchanges between and among elected representatives. It is the stuff of many lessons I have taught in the past; demokratia - democracy. It is the cornerstone, the foundation of our Western civilisation. It is the principle of the rule of the people, by the people. It is the stuff that some have attempted to "impose" on other societies (rendering the concept invalid in that narrative - you cannot force democracy, that is an oxymoron). From sitting in on debate in the House of Commons at 15 year old, to listening to hour after hour of debate in Westminster, later Holyrood and now at local government level, I was reminded again, this is what we are. A people who will debate, often acrimoniously, often with emotion and empathy but debate nonetheless. We do it this way, we do not resort to silencing our opponents through show trials, imprisonment, exile and worse in many parts of the world today. We are mindful that whilst our ego and political ambition may drive us, that ultimately an elected representative, all elected representatives are there to represent the people - not only the people who voted for them. All the people. To give the people a voice. That is why we are there and we should never, ever forget that. Having been voted down in July to go ahead with rezoning of primary schools, Officers had returned to the table with the same option. 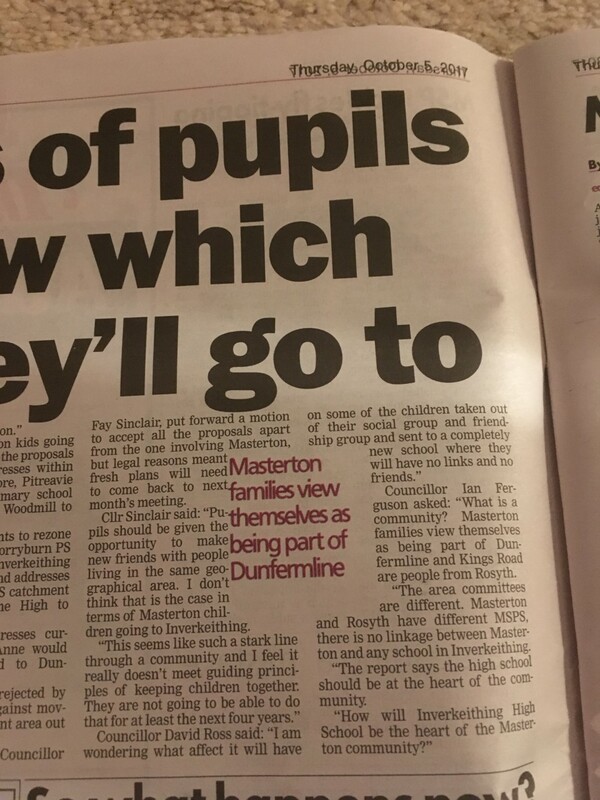 Pupils at Masteron Primary School were to be removed from their Dunfermline community and sent to Inverkeithing High School, rather than the local school, Woodmill. Following a series of engagement sessions which had brought in parents from across the Dunfermline and West Fife affected areas, Officers had decided that of 7 options (why 7 I am uncertain, given that 5 of them were outrightly rejected by Officers at engagement session, perhaps to muddy the waters, the cynic would claim) only 2 were viable ways ahead and the one on the table on Tuesday was to rezone Masterton (the most controversial of the proposals) to a school outside of Dunfermline. Whilst Officers presented what they clearly believed to be a strong case, including some fantastic maps, which in theory (note the word *theory*) looked like it should be a fairly simple decision - continuous border from Masterton Primary School to Inverkeithing High School - provided you omit from your line of sight that pesky motorway and the lack of any safe walk route, elected representatives did not quite see it the same way. Extensive questions were brought to the discussion by councillors which included - what is a community? From every definition of what is defined as a "community" the rezoning of Masterton just wasn't creating a clear fit with that. Is no safe walk route to school what we should be encouraging in 2017? Public buses home looked great on the timetables but didn't take into account the often long walk home and busy roads and not to mention the long, dark Winter nights we have in Scotland - do you want your 12 year old child on a public bus at 6pm on an icy Winter evening? 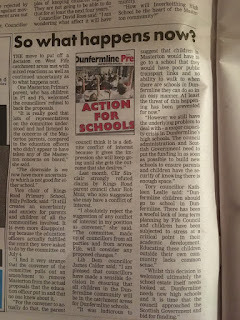 Is it right and fair to disengage young people from their local community - that is the community with after school clubs and activities within Dunfermline where often some of their previous primary school peers will be attending? Whilst Officers battled against every question posed to them they must have realised their arguments were just not being bought into. My first question to them was - who had spoken to the young people? Who had asked them how they felt about this ongoing uncertainty? Who had felt it right to issue diaries to them for the high school they may not be attending? Who had decided it was ok to attend a visit to the high school they may not be going to? Who had asked them how the pupils in the affected addresses would feel about not going to high school with their peers? The short answer is - no-one had. The engagement session had brought along potentially affected parents, parents who from many of the emails I received, as did other councillors, were asking why Officers did not answer their questions at the engagement sessions? Many were writing stating their dissatisfaction at the way their questions and concerns had been responded to. Whilst Officers pushed on with their case and appealed to Councillors to accept their recommendations and move to a statutory consultation, others around the room felt uneasy. Returning to my earlier point - elected representatives are there to represent the people. To listen, to consider their views and make the best, often difficult, decision. No politician will ever claim to get it right for everyone every single time, but we have to try and get it right as often as we can. Tuesday was one of those days whereby the concerned voices of the people were on our minds. To simply have approved Officers recommendations, would have been in my view, wrong. 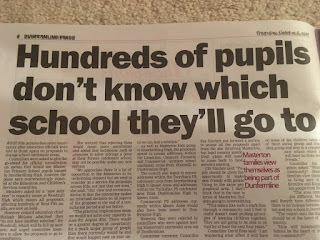 Moving Dunfermline pupils out of Dunfermline schools due to shocking foresight on the part of previous Administrations to properly address the looming capacity crisis at Woodmill High School, would quite simply, we wrong. Therefore, an amendment was proposed which would remove Masterton Primary School from the proposal - one in which myself and my colleagues in the Conservative group agreed with. However, advice on the legality of removing one school was sought and it was considered that to do so would mean a revising of the whole proposal as it would not be possible to resolve the capacity crisis by doing this. The result being a new proposal will need to be developed and brought back to committee next month. At this point, I realise that not every affected parent is going to be in agreement with our decision, some may even see it that we should have listened to Officers, but I go back to my original point - we are elected by the people, we have to listen and if that means postponing a decision until we can get an option that will not only satisfy as many people as possible but be as a result of listening to the people, then we are getting it right. Whilst Officers may believe we have made their job difficult, they are not directly accountable to the electorate, we are. As I commented a few weeks ago - Councillors decide policy, Officers execute policy - not the opposite. Ultimately we are at this point due to a lack of constructive long-term planning in the past on the part of Fife Council and the Administration. 8,000 homes have been built around Dunfermline since 2000 - many of those being 4 and 5 bedroomed houses, houses for families - houses with children who will need a high school to attend. Why this decision has been put off and put off for so long is really quite puzzling. The current situation is there is £50 million in the Capital fund for new schools - 3 replacement schools, is my understanding. However, due to 2/3 of the money in the past coming from Scottish Government funding, it appears that Fife Council is awaiting this option again. I did ask this question at last month's committee meeting and was advised bidding would begin in 2018. My belief is we begin that process now. Houses continue to be built, primary school children need high schools, the capacity issue will not go away. Instead of continuing with half-baked concepts of rezoning and trying to convince anyone that there is any educational benefit in separating young people from their local community, depriving them of a safe walking route to school and removing them from their social and friendship groups, it is time to start the process of building new schools. Whatever your political persuasion, if we all agree that education is our number one priority, lets get on and prove it. Following committee I produced a press release of which only a limited part of the comment was to appear in the local paper, The Dunfermline Press. Myself and Cllr David Ross both contributed to this and whilst his part of the press release does not appear in print, his comments to the committee do. Below are our comments. “Dunfermline has seen a prolonged period of house building, with near to 8,000 new homes since 2000. For little consideration to have been paid to what was always going to become an issue over school capacity, is quite simply astounding” said Cllr Leslie. She went onto say; “Whilst this decision is welcomed ultimately the school estate itself needs looked at. 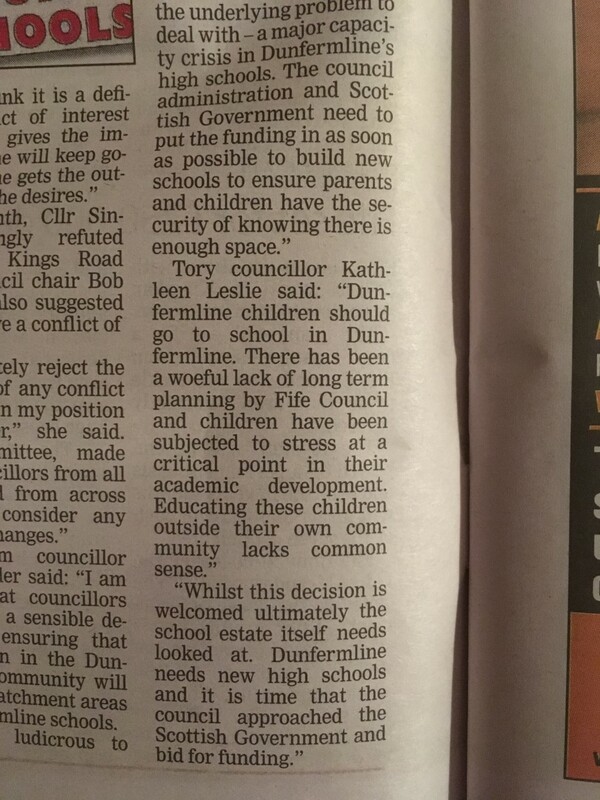 Dunfermline needs new high schools and it is time that Fife Council approached the Scottish Government to begin bidding for funding. Until every high school in Dunfermline is fit for purpose, rezoning is only a short-term solution and capacity will appear on the agenda again next year." 1. What plans the Administration has to facilitate the training of Early Years Officers for the increased Early Years & Childcare provision as of August 2020? 2. 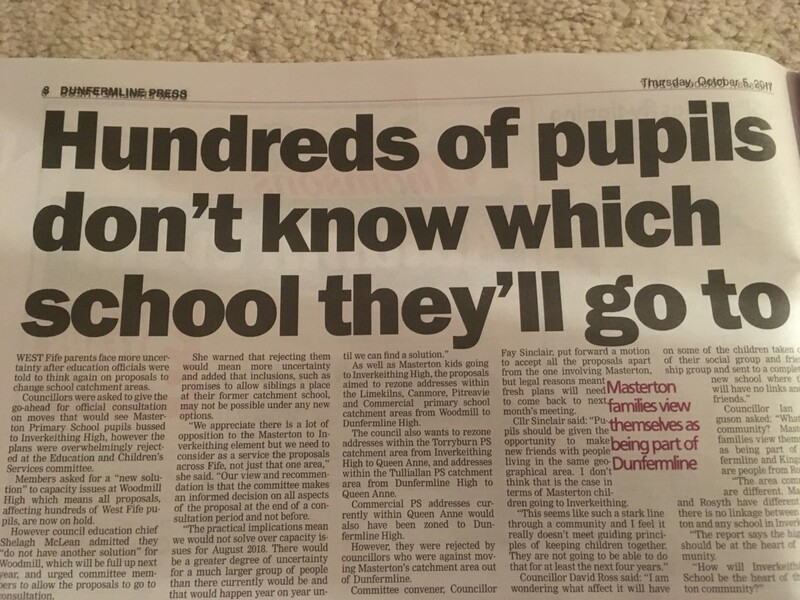 When the Administration will begin the process of building new high schools in Dunfermline? To both I had fairly predictable, if somewhat uncontroversial answers. Whatever our thoughts are on the increased EYC provision (see link http://www.kathleenleslie.co.uk/2017/08/education-childrens-services-response.html) there are processes in motion to train and recruit the anticipated additional 400-500 EYOs required. It was my supplementary question which I really wanted an answer on. The supplementary question asked: Currently Fife Council has 315 Supply (no contract) EYOs, does the Administration plan to provide newly trained EYOs with permanent contracts given the likely changing demand for EYOs on a week by week, month by month basis or does it intend to keep highly trained individuals on 52 week stand-by? Here I do not believe I was given an answer. I wanted to raise this point for two very specific reasons. Some years ago I spent near on two years working for Fife Council as a supply teacher - week by week, month by month and then one year to the next with no permanent contract. I fulfilled the remit of a permanent teacher, going as far as to attend parents evening with no extra pay, but with no job security whatsoever. Across Fife teaching staff are "employed" in this manner. They teach in schools up to certificate classes yet have no contract. Whilst the Conservatives have been much targeted over the "zero-hour contract" this is common place in Fife. Some teachers (often retired) are more than happy to work in this way, it offers flexibility but that does not by any means account for everyone. I would imagine it would be difficult to find a school in Fife which does not have at least one supply teacher on its books. That one teacher who will diligently do their job whilst knowing that there is no job security and on day one of the summer holidays the money stops. That simple. My concern is that the same will happen with newly trained EYOs. Interestingly at the Area Committee meeting on Tuesday afternoon a proposal was put forward that those employed to work on assisting people with the new Welfare reforms should be employed on permanent placements, because as the convenor, rightly pointed out, not having a permanent contract means not being able to apply for a mortgage amongst other things - let us keep that in mind when the new Early Years provision is rolled out - people employed need permanent jobs. My second question was not answered as I had been hoping for. 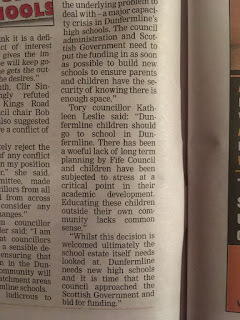 I had rather anticipated some forthcoming about approaching the Scottish Government for funding for new schools but was rather met with a response about looking at the school estate. There has been talk now for years of the need for new schools - I have gone back through various press releases and commentary on this from both Labour and the SNP and demands and promises, yet we still seem to be stuck. 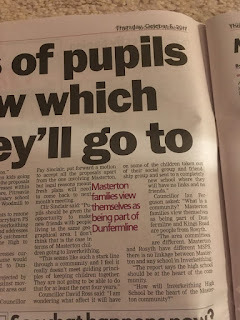 Rezoning attempts will only hold for so long, Dunfermline needs new high schools - not only due to capacity but also due to age and longevity of some of the schools. For pupils to have access to state of the art facilities, technology and teaching classrooms geared up for the 21st century and in line with a focus on STEM subjects, the learning environment must prove to be conducive. We must keep pushing this issue. On that note I will end this post. 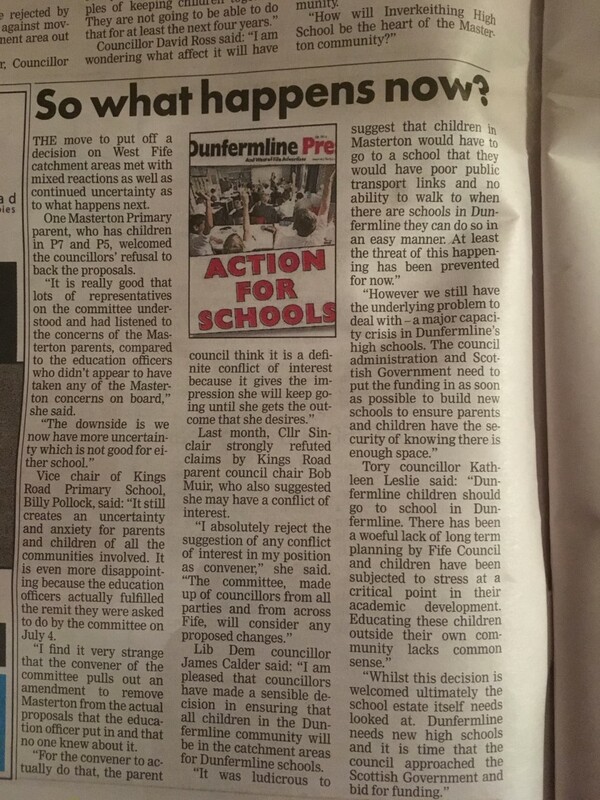 Below are extracts from today's Dunfermline Press including both mine and Cllr Ross's comments. Last month I wrote a post questioning the establishment of Regional Collaboratives in Scottish education and the democratic deficit they were likely to create. Under proposals, local accountability, on the part of local authority scrutiny would be effectively side-stepped from the equation as regional directors of these collaboratives would report back to Scottish Government quango, Education Scotland. Three days ago Education Secretary, John Swinney dramatically appeared to call a halt to this direction of travel, albeit under ongoing concerns and enquiry from COSLA. In this post I will present a summary of where proposed governance of education is/was headed and the deep concerns that COSLA representatives expressed and then outline the new considerations and my thoughts on these. I wrote about this a few weeks ago and therefore, have taken some of that text and inserted it here, to read the full article please go to: http://www.kathleenleslie.co.uk/2017/08/education-childrens-services-response.html . In September 2016, the Scottish Government began a review that sought views on how education in Scotland is run, on the back of that a paper (Next Steps) was published by John Swinney in June this year claiming that a “revolutionised approach” would be taken towards support and improvement in schools. As so often happens though the devil is in the detail and that is where it became interesting. On the one hand claiming to grant “sweeping new powers to headteachers” whilst on the other, and the reality, was that regional collaboratives would be set up and headed by a director who would report back to Scottish Government quango, Education Scotland. Fife (my local authority) would be netted in with the South East Scotland grouping – Edinburgh, Midlothian, East Lothian and the Borders. Local government would effectively be removed from the equation other than administrative responsibilities of providing support services, developing the provision of early years and childcare and appointing headteachers. Predictably, and rightly, the Convention of Scottish Local Authorities (COSLA) hit back at such proposals and stated that the creation of Regional Collaboratives was a “top down approach…not in the spirit of initial proposals by leaders” and that “Scottish Councils hold the statutory responsibility for the provision and delivery of education for performance and improvement of individual schools as well as cumulative authority…the “Next Steps” paper disaggregates the strategic leadership role of local government and proposes redistribution of functions, which has an impact on democratic accountability”. Accountability at the local level to Councils and elected representatives would be, at best, diluted and would mean that rather than strengthening local government it would be cast by the way side and instead be ad continuum of this SNP Government’s policy of centralisation, as we have seen with the subsuming of regional police forces into Police Scotland (which has demonstrated to be a catalogue of disasters). A further rebuff to local accountability with this proposal was that local stakeholders – parents and carers, were not consulted on their views on the demise of local accountability in regards to their children’s education. If they choose to challenge educational practice within their local authority where and to whom are they to go? Such a move is to be welcomed. Any moves to further remote local government from educational governance would mean a lack of accountability and transparency and distance not only elected representatives (who are the voices of local people) but parents and carers as key stakeholders in their children’s education. Given the protracted difficulties with implementation of the Curriculum for Excellence, the shambolic state of the National qualifications, teacher shortages, crashing numeracy and literacy against international scores and a failure to close the attainment gap one is left to wonder what other significant damage the regional collaboratives were likely to create? Or to the cynic, was this an attempt to create further distance between the people and holding government to account for deficits in policy?